Euonymus fortunei juvenile leaves on tree. By Arthur Haines. Copyright © 2018. New England Wild Flower Society. gobotany.newenglandwild.org (Accessed 6/2018). Euonymus fortunei is a trailing evergreen ground cover to climbing shrub, sometimes climbing high on tree trunks; stems rooting, climbing to 20 m, young stems green, minutely warty. Euonymus fortunei on tree. Kansas Native Plants. kansasnativeplants.com (Accessed 6/2018). 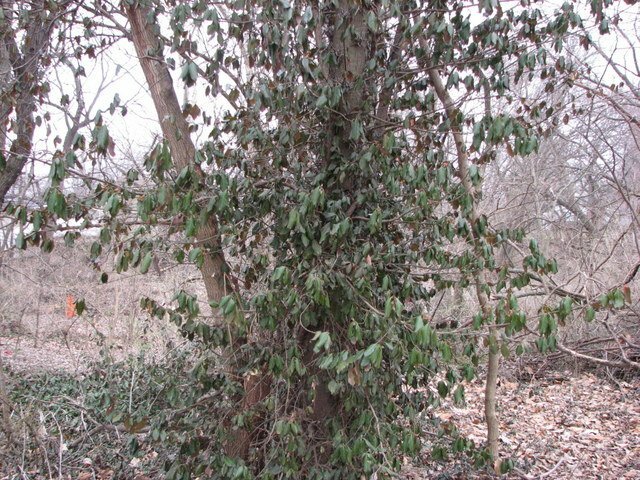 Leaves opposite, evergreen, about 2 cm on trailing plants, to 6 cm on climbing, or shrub-like, flowering plants, tip pointed, base broadly wedge-shaped, margin sparsely toothed, veins on some cultivars silver; leaves often reddish, especially on underside, in winter. Euonymus fortunei flowers and mature leaves. By David G. Smith. Copyright © 2018. Delaware Wildflowers. delawarewildflowers.org (Accessed 6/2018). 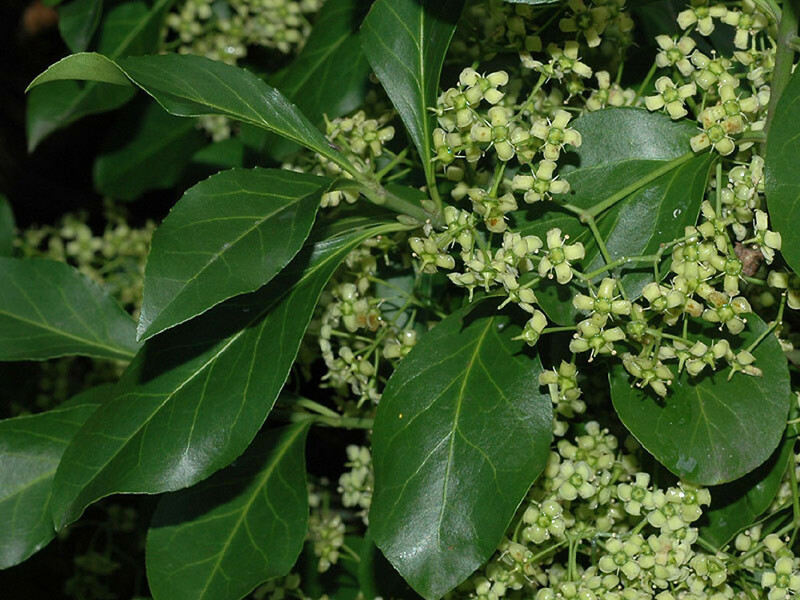 Flowers very small, greenish white, 4-parted, in sparsely branched axillary clusters, inflorescence stalks 2-5 cm, green, slender; blooming June-July (Dirr 1990). Euonymus fortunei fruit. © Les Mehrhoff, 2008-2010. Discover Life. discoverlife.org (Accessed 6/2018). Fruit outer covering hard, reddish, or pinkish-white capsule, ca 0.8 cm, rounded, splitting open to expose fleshy, bright orange aril-covered seeds. (Dirr 1990). Arils probably eaten by birds, which disperse seeds. Euonymus fortunei covering ground. Kansas Native Plants. kansasnativeplants.com (Acessed 6/2018). Habitat: Escaped from cultivation, most likely from cuttings in yard waste and at old house sites. 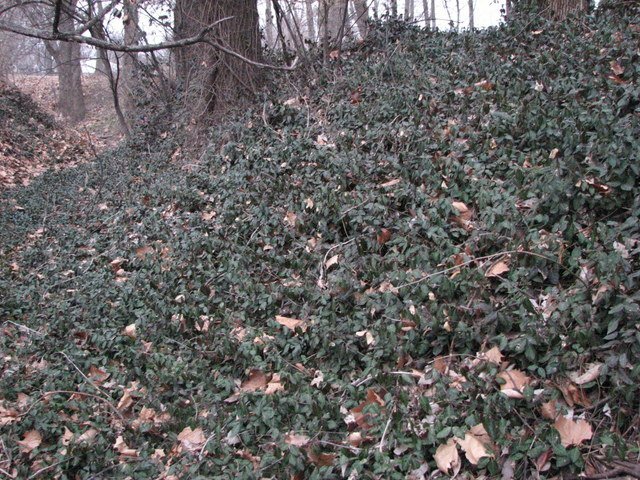 Shade tolerant, moist upland forest understory. 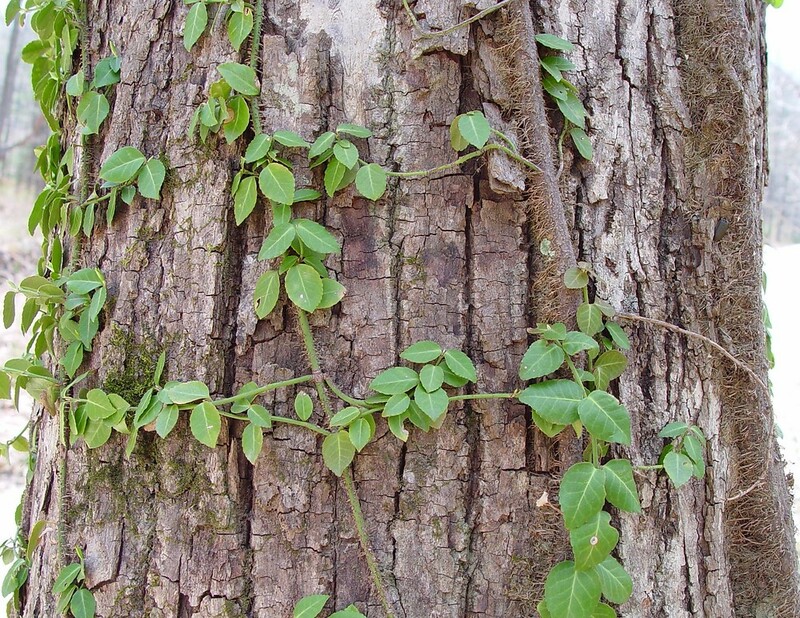 Notes: Often infested by Euonymus scale (Unaspis euonymi). Males bright white, narrowly rectangular, about 0.1 cm long, sharply ridged along back; females brown, slightly larger than males, tear-drop-shaped, back rounded (use lens); Fertilized females overwinter on plants, lay eggs in spring, protected by scale cover, eggs hatch in June, and the nymphs crawl to new sites on the plant. 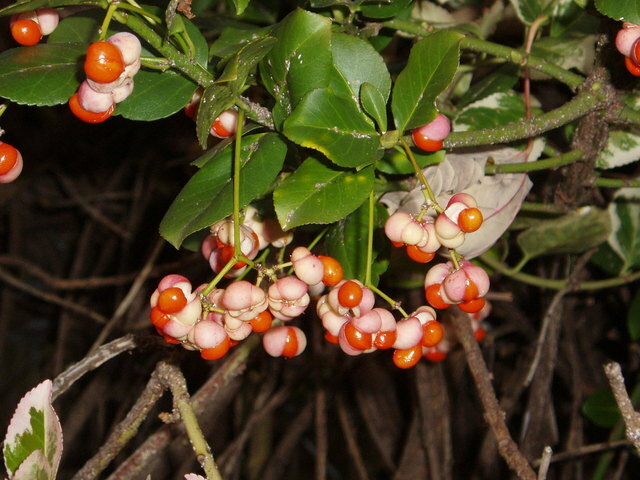 Euonymus scale is preyed upon by two insects that were introduced from Korea as biocontrol agents. These scale predators are Chilocorus kuwanae, a lady beetle, and Cybocephalus sp. (probably C. nipponicus), a nitidulid, sap beetles, (Borror and White 1970; Johnson and Lyon 1991).